Telling business stories - do you take short cuts when telling yours? Do you take short cuts when telling your story? While our clients vary from sole traders to multinationals, selling anything from chocolate bars to big tech installations, they’re all confronted by a similar task. They need to tell the story of their product or service. And telling business stories is tough work. From our experience, trying to do this in house is a challenge. When we first speak to clients, they often flood us with details. They know their product inside out, and want to tell everyone everything. We know that isn’t always the best approach. Over the years, we’ve developed a workshop format combining classic story telling techniques, a little business coaching and a lot of questions to challenge our clients to really get to the heart of their story. The process is hard work and often not quite what the client expects. I think that as a ‘script’ meeting, they’re expecting to be going through words on a page. They don’t see selling products as telling business stories. One of our first questions is “How do you want your audience to feel about this project?” It’s amazing how the mood in the room changes when clients start talking about wanting their audience to feel intrigued, excited, and involved. 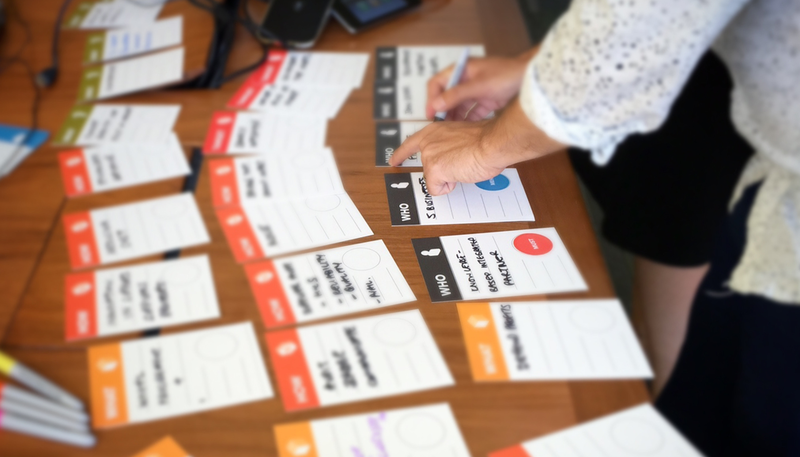 We use a set of specially designed cards and stickers to make this workshop a physical experience, and we’ve seen clients get really get active, walking around the room, interacting, laughing, and bartering over story points. By the end of session, we’ve looked at the audience, what their needs are and how the film will appeal to them. We’ve cut all the content back to a Minimal Viable Video script – the shortest possible video that will have the greatest impact. We’ve built this back up to an outline of the script, taking into account how we can punctuate the video with key plot points. We get more achieved in two hours than we have in weeks of sending word docs back and forth! If you’re planning a marketing push, whether or not that includes video, and you want help in building your story, then let us join you for a workshop! “What a revealing process! For a subject matter I knew inside out and with pre-conceived concepts and storytelling strategies in place ready to roll-out, a couple of hours’ evaluation with Napoleon not only sent the baby out with the bathwater, but the bath tub too! Part one of the workshop set the scene. Not ‘what is the subject matter’ but more the psychology, from both the selling and buying points of view. Easy to jot down but invigorating as Napoleon got to grips with what it really meant. Their ability to listen, comprehend, evaluate and challenge was enviable.